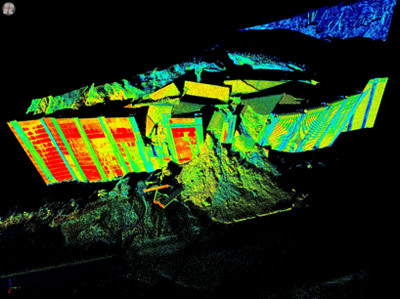 Terrestrial Laser Scanning (TLS) and Global Positioning System (GPS) technologies provide comprehensive information of landslide deformation in the both spatial and temporal domains, which are critical to study the dynamics and kinematics of landslides. TLS allows the generation of a precise 3D model of a landslide surface by deriving spatial deformation from consecutive TLS campaigns. Continuous GPS (CGPS) monitoring allows the generation of the displacement time series of single points. Integrated TLS and CGPS datasets were collected at the base of a 500-600 meter long landslide on a steep mountain slope in the El Yunque National Rainforest in Puerto Rico. Major movements of this landslide in 2004 and 2005 caused the closing of one of three remaining access roads to the national forest. A retaining wall was constructed to restrain the landslide and allow the road reopen. Prior to termination of the wall a significant portion of the northwest end of the wall failed. This portion was repaired but prior to final termination in August 2009 significant soil displacements behind the failed section thwarted final grading efforts. Geologic investigation indicated that the landslide extended much further upslope than indicated and involved bedrock as well as overlying residual soils. Striations along flank escarpments indicated displacement of the entire landslide to the northwest but active displacement could only be certified in the lower most portions behind the retaining wall. The northwest portion of the wall continued to show flexural deformation until it finally burst in July 2010. The size and displacement magnitude of the presently moving mass has become a major focus of investigation. To precisely identify the present boundaries and displacement magnitude of the lower portions of the landslide, we performed two TLS campaigns at the landslide site in May and August 2010. A continuous GPS array consisting of 3 stations was also installed at the site, one of which was located outside of the landslide as a stable reference point. Topcon GB-1000 dual frequency receivers and PG-A1 antennas were used to collect the GPS data. GPS data were processed using Topcon software. A Riegl VZ-400 laser scanner, provided by UNAVCO, was used to collect the TLS data. This scanner provides high resolution, high-speed data acquisition using a narrow infrared laser beam and a fast scanning mechanism. 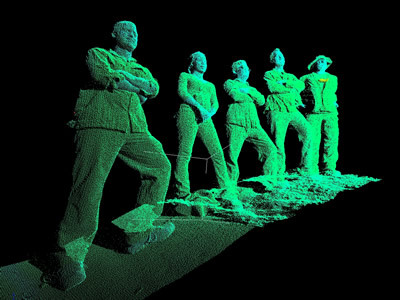 Centimeter-level scans from 12 scan positions were performed during each TLS campaign. TLS data acquisition and global registration were performed using RIEGL RiSCAN-PRO software. The Generic Mapping Tools (GMT, http://gmt.soest.hawaii.edu), a software package widely utilized in the geophysical community, was used for data post processing and map plotting. Figure 1 - TLS LiDAR point cloud of failed retaining wall at El Yunque landslide study site. Points are colored by laser return intensity. Figure 2 - TLS LiDAR point cloud of the El Yunque landslide research team. From left to right: Felix Rivera Santiago, Arlenys Ramirez, Bob Wang (PI), Gustavo Galan, David Phillips. 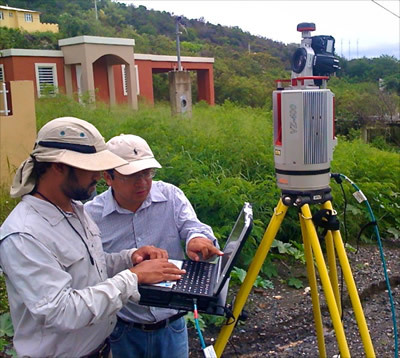 Figure 3 - PI Bob Wang and student Felix Rivera Santiago using UNAVCO’s Riegl VZ400 scanner to survey a landslide study site near Ponce, Puerto Rico.